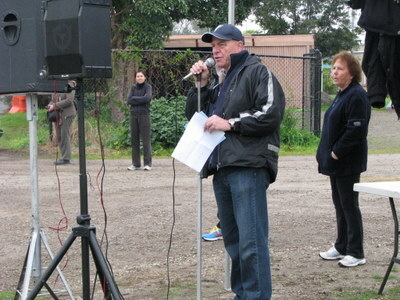 Stuart started racewalking in 1966 while a student at Caulfield High School. He joined St Stephen's Harriers in Melbourne and started what was to become a life long association with the sport of racewalking. He joined the Victorian Amateur Walkers Club soon after this. Stu competed regularly throughout the 1970's as an A grade walker in the summer season and as a road walker with VAWC in the winter season. He has Stu has been a member of our club off and on since then and has always been involved at much more than just a competitive level. He was a good walker in his heyday, representing us at many interstate carnivals and becoming a centurion along the way. He was well known for his great crowd pleasing performances with the guitar during the long bus trips to Canberra for the annual Lake Burley Griffin 20 mile championship. His playing and singing were always in demand and fondly remembered by us. In Feb 1974, he took over 'Heel and Toe' as a monthly newsletter costing 10 cents and a number of issues were produced over the next couple of years. At the start of the 1977 season, he was joined by Tim Erickson and the issues became more regular with Stuart doing the front cover and editorial and Tim doing the reporting and news and typing and printing. The combination lasted some 2 years with the last issue being in 1979. 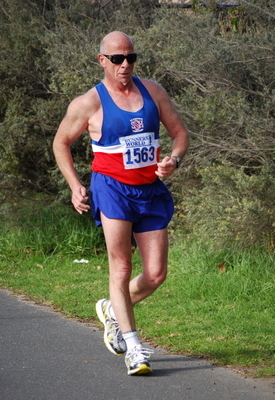 His last serious season was 1981 when he competed very well in the Canberra 20 mile championship and completed two 50km events. It was in 1984 that he suffered the groin injury that effectively ended his career and since that time he has only walked intermittently. But to give him due credit, he has never officially announced his retirement and is still to be seen on the odd occasion striding out at walking events. VRWC Publicity Officer - gathering the results and forwarding them to the newspapers each week. VRWC Cameraman - producing the weekly photos for Heel and Toe for at least 6 years before others eventually took over. VRWC Committee Member - he has been an enthusiastic and energetic contributer since coming on board. VRWC Judge and Official - he pitches in with officiating or judging every week and can always be relied on to take a leading role (eg race entries, etc) if needed. VRWC Facebook coordinator - Stu setup and spearheads our facebook page. The Life Members of the club are pleased to propose Stuart for Life Membership. His services to the club extend over 40+ years and he has well and truly earned this recognition. Stuart was awarded VRWC life membership in 2012.